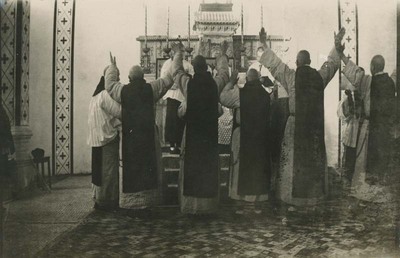 "Raising arms during ceremony of final vows"
Fr. Vincent Lebbe is the first Brothers on the right. Raising arms during ceremony of final vows. December 24, 1933. Société des Auxiliaires des Missions (SAM) China Photograph Collection, Whitworth University Library, Spokane.